Will You Still Love [This Song] Tomorrow? Last week I posted a research survey on this site to investigate the way listeners infer meaning from song arrangements. Thanks to all of the Facebook, blog and Twitter contacts who responded. Some of the respondents have asked me to publish the results, so here they are. The text below is part of a forthcoming research publication which should be available sometime in 2014. It is self-evident, or perhaps a tautology, that an audio recording of a song carries cultural meaning for the listener, but to what extent does the listener infer meaning (from the track) that was not created by the songwriter? To borrow from Allan Moore’s terminology, to what extent is the track one of the ‘means by which songs can mean’? To provide an objective/measurable example of the way ‘performance’ can create listener inferences I devised the following simple listening experiment, conducted using an online poll. Participants were asked to select randomly one of two unidentified recordings ‘Song A’ and ‘Song B’ and listen to only one of them. ‘Song A’ was Carole King’s 1970 recording of the Goffin/King composition Will You Still Love Me Tomorrow? ‘Song B’ was the Shirelles’ recording of the same song from 1960. Importantly, both recordings share the same melody and lyric as each other, with near-identical harmony, but are performed in different styles (‘singer-songwriter’ and ‘1960s girl band’ respectively) and at different tempi. Listeners were asked to speculate about inferred/imagined events – that is, to provide information about the characters and story that is not provided in the lyric. What do you imagine is the approximate age of the main character? What time of night do you imagine when you hear the song? Is the main character gay or straight? Where do you think the story is set? Do the characters sleep together? There were 138 respondents – 86 randomly chose Song A (King’s version) and 52 opted for Song B (The Shirelles). The aggregated/average answers to each question were measurably statistically different in each case. The averaged inferred age for the Shirelles’ protagonist was 22; the King respondents made the narrator older, at 27; notably but perhaps unsurprisingly, both averages are close to the respective singers’ actual ages at the time of the recording – The Shirelles’ Doris Coley was 18; Carole King was 28. The average imagined time of night was slightly earlier for the Shirelles song (10pm) than for the King one (11pm). Almost 99% of respondents (all except one) assumed the character was heterosexual, which statistically correlates approximately with the 21st century LGBT demographic population at large. 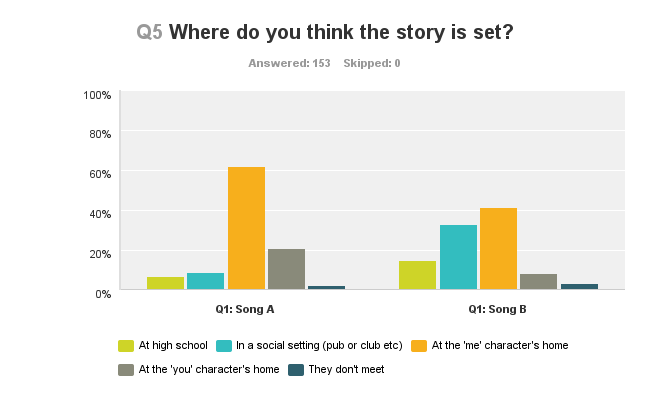 Most respondents for both songs assumed that the song’s events took place at the protagonist’s home, but the Shirelles song made a significant number of listeners (28%) think of a social situation such as a pub or club (9% for the King version). 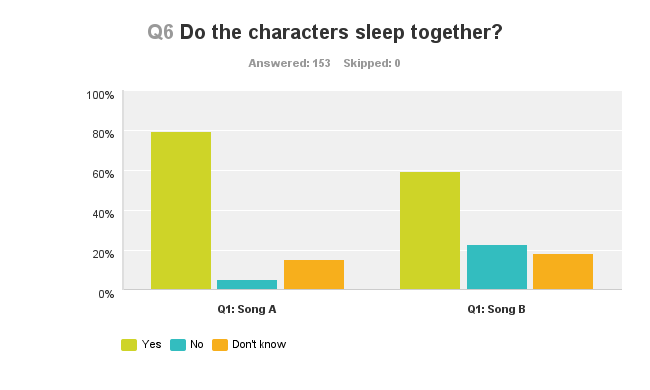 The biggest statistical difference was for the question ‘do the characters sleep together?’. 95% of the King group said yes, but only 70% for the Shirelles group. 41% of listeners (who expressed an opinion) believed that Carole King’s character’s relationship ended the following morning, but only 30% of the Shirelles respondents believed that the protagonist was left lonely after the evening’s romantic encounter. The survey results demonstrate the obvious truism that recordings carry meaning (in this case narrative meaning) beyond that which is encoded by the songwriter. We can make educated guesses as to the triggers; King’s ‘smoky’ voice could be thought of as more ‘late night’ sounding; the implied high-school innocence (and performer’s age) in Coley’s vocal could make some listeners infer that it is less sexual than King’s world-weary vulnerability implies; King’s languid tempo (79BPM) and understated middle-register ‘hymnal’ piano chords may imply a more mournful interpretation (and therefore a broken-hearted outcome) than the Shirelles’ lively 138BPM with its cheerful double-snare backbeat and trebly rhythm guitar. It is possible that listeners could be inferring many of these cultural meanings based on the way both recordings (particularly the Shirelles single) have been reused in popular culture since their original release (in advertisements, films etc). But as Moore has argued, all listeners have an individual and personal cultural (and historical) context through which they receive meaning from songs. The experiment proves the point that the songwriter plays a partial role in constructing meaning for the listener, and that the song, performance and track function as an aesthetic whole. Does this make a nonsense of the administrative distinction between publishing and sound recording? Someone should probably write a research paper about that. More listeners thought The Shirelles version of the song was set in a pub or club; the Carole King performance suggested more of a home-based setting. 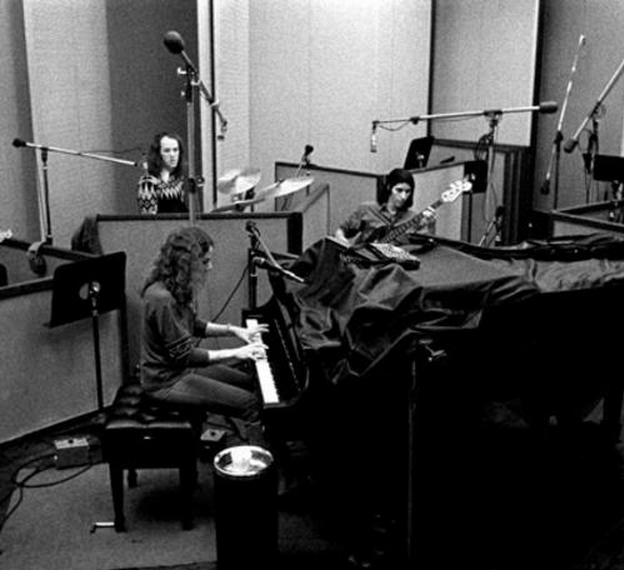 A significantly larger proportion of listeners to the Carole King song inferred that the characters spent the night together. Allan F Moore, Song Means : Analysing and Interpreting Recorded Popular Song (Ashgate, 2012).3. Joe Bennett, “Love Song Survey,” Surveymonkey Web Poll, September 2013, http://www.surveymonkey.com/s/lovesongsurvey. There is no ‘correct’ answer to any of these questions – these facts are not revealed in the lyric. Any answers given by listeners must, by definition, be imaginary inferences based on non-lyric content. The songs being the same in both cases, any differences in the answers must therefore represent differences in meaning encoded in the track and/or the performance. The ‘don’t know’ category has been subtracted and calculations made based only on those respondents who expressed an opinion. The numbers of respondents on which the calculation is based are large enough to maintain the statistical reliability of the outcome. Filed Under: Joe Bennett (Bath), Research, Songwriting Tagged With: carole king, Research, Songwriting, will you still love me tomorrow? « Songwriting survey – your ears needed!